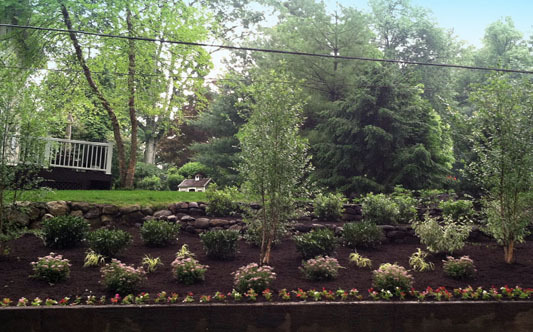 Two Brothers Landscaping serves Morris and Essex counties and surrounding areas in New Jersey. 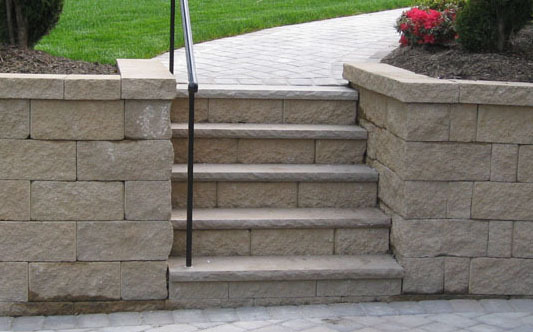 We offer a wide variety of lawn and masonry services. Two Brothers Landscaping was founded in 1996 by brothers Victor and Alex Calle. Both Victor and Alex continue to run and supervise the company as an integral part of daily sales and operations to consistently provide great customer service. Contact us today for a FREE estimate. With any service based business, especially landscaping, the key to success is in the group of people performing the job. We have a large team, each with their expertise and knowledge of landscaping from: design, implementation, planting, fertilizing, masonry, hardscape, lawn care, drainage and irrigation. Each job has a foreman and supervisor experienced in all aspects of landscape and were chosen for your specific need. Our vehicles present a neat and professional appearance while our equipment is modern and well maintained. Quality service is what you can expect when you hire Two Brothers Landscaping. Contact us today for a FREE estimate. Our goal is to provide a long-term solution for our clients that will not only add beauty to their landscape, as well as enhance their environment. Your landscaping is the first thing people see — not to mention is what you see when you look out of your window. It truly is an extension of your home. We understand how important it is to you. We strive to deliver a superb experience that is just as flawless as our finished product. That is why most of our business is based off of referrals and word of mouth. If we did not stand behind our goal — we would not be as successful with such a strong client base. We thank you for your interest in Two Brothers Landscaping. Feel free to contact us, and let us make your house come live. Two Brothers Landscaping is fully Insured, and worry free of the legal issues you could incurr. In the State of New Jersey if you hire any type of contractor such as builders, landscapers, or other trades people who work on or around your home, they must be covered through their own workers' compensation insurance. Any injury claims would be covered under that policy and not the homeowner. However, if for some reason, you hire a contractor that does not have coverage you would be next in line to pay for a worker's injuries and/or disabilities that occurred on your property. Therefore you must be diligent and do your homework and ask for proof that they are 100% covered properly, like Two Brothers Landscaping. 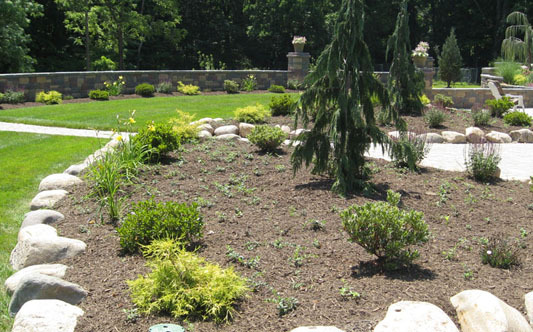 We provide a complete list of landscape & hardscape needs. Let us make your home come alive. Wether it's simple lawn maintenance, landscape design, retaining wall, regrading or your new outdoor kitchen…Two Bothers Landscaping has the tools and unsurpassed craftsmanship that will make your home envious in eyes reach. From a small and simple plan to an extravagant design, our team can work with you to design and install the yard of your dreams. We can plant your trees, shrubs, annuals, and perennials, working with you to choose a variety of plants and trees that will compliment your yard. Keep your plant beds neat each year with fresh Cedar, Hemlock, and Bark mulch. Choose from blonde, brown, red and black to compliment your yard. We offer both weekly and bi-weekly services, thoroughly edge the properly, weed the plant beds, and bag and dispose of grass clippings. Keep your lawn thick, lush, and green with our fertilization programs. We can design a program fit for your lawn. Leave it to us to remove leaves, branches, and other debris throughout your property - and we dispose of it too. Keep your yard healthy each year. Dethatching in the spring and core aeration in the fall will help promote a healthy, lush lawn the following season. Promote healthy plant and tree growth with a deep pruning every summer. Keep your current landscaping neat and shaped as it was the day it was installed. Let us solve your water problems and design a proper drainage system and make the most of your entire yard, while maitaining funtion and beauty. From general over seeding, brand new seeded lawn or perhaps get a fresh start with complete sod installation — 100% weed-free Kentucky Bluegrass. From decorative to privacy fencing, we can give your yard the function you are looking for. We install vinyl, wooden, and chain link fences. 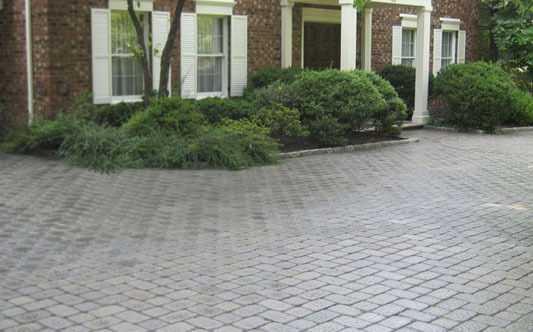 Choose from a wide variety of brick paver systems to make your hardscape stand out. Pick from a variety of colors, textures, and patterns. Give your yard dimension. From a simple garden block to a large-scale stabilization wall, we can design a retaining wall to fit your needs. 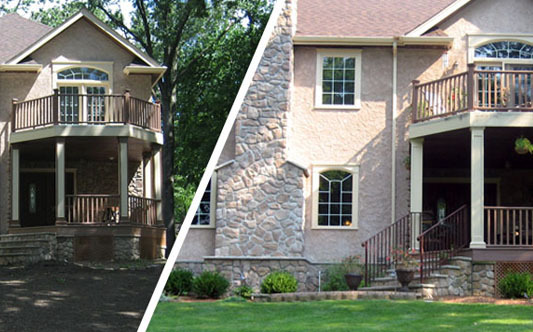 Give your house a stone face - inside or outside, from cultured stone faces on your house, foundation, stairs, and fireplaces. Take the party outside. We can install an outdoor living space inclusive of outdoor kitchen appliances, a bar for entertaining, and a fireplace to huddle around. In addition to snow removal, we offer ice control applications to melt ice and keep your walkways and driveways slip-free. Rest easy this winter! We take care of all of your snow removal needs with 24-hour services. Residential or commercial. All work is done by us and not sub-contracted. Two Brothers are wonderful! Their service was second to none. They were easy to get a hold of, very punctual and extremely hard working. Alex advised me on what would look best on my rock wall and the end result was more than I expected. My entire block has commented on how great my front looks. I would highly recommend Two Brothers and plan on using them every year to keep my front looking its best. We are extremely happy with the services that Two Brothers gave us. They came in with their crew and transformed the front of our house into a beautiful landscape. We highly recommend them. This company gives great service and has taken care of all of our landscaping needs including leaf clean-ups, lawn maintenance, a paver walkway, and snow removal! Highly Recommended! © Two Brothers Landscaping 2015-2016.